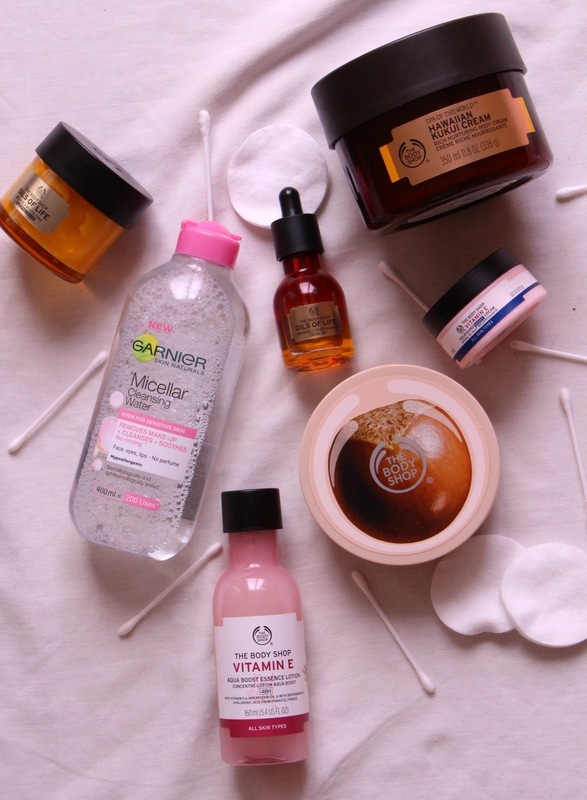 After doing a post on my Night Time Routine I decided to share with you guys some of the amazing products I've found that really help during my little nighttime pamper ritual. Nearly all of the products do come from The Body Shop, one of the perks of working there is I get lots of freebies and get to try many new things however all the thoughts and opinions are my own and I've not been sponsored to do this. So lets get started! 1. Garnier Micellar Water - This is amazing! It takes off all my make up super quick but is incredibly gentle to my skin. I have sensitive skin on my face and so I often find make up removers react but this one is fantastic. I use this every night to take off eye make up and my foundation. 2. Vitamin E Essence Lotion - I had never used an essence lotion before joining The Body Shop but having used this one I am now totally hooked. You apply it after cleansing and toning your face but before your moisturising products and it basically acts as a sponge for your serum and moisturiser. It helps the skin to absorb all that good moisture and lock it in over night. Its amazing! And since using it I have noticed such a difference in my skin. 3. Oils Of Life Facial Oil - Again, before working at The Body Shop I had never used a serum or facial oil before but after I started to use this I noticed a huge difference in my skin. It goes on after the essence lotion and before your night cream. An oil is different to a cream as it soaks down to the third layer of the skin and works it way up rather than a cream that sits on the top layer. Its a really important addition to the skin care routine and this particular leaves my skin feeling hydrated, radiant and protected. I only apply it at night however as I find it too heavy for the morning but if you have very dry skin you can use it for both day and night. 4. Vitamin E Night Cream - I love the vitamin E range, having had dry skin my whole life this is the perfect go to product for me. The night cream contains wheatgerm oil which is a really natural source of Vitamin E and super hydrating for the skin, it helps to replenish moisture, protect and hydrate the skin throughout the night when the skin is going through its cell renewal process. 5. Spa Of The World Hawaiian Kukui Cream - This stuff smells divine! And the texture is lovely. I like to apply this over the whole body before bed and really spend my time massaging the product in. 6. Shea Butter - This is another wonderful body butter and I do sometimes use this over the whole body particularly if my body is feeling dry however I've found that shea is particularly good for my feet. I like to take a little bit of the butter and rub it to the soles of my feet before getting into bed, I find this helps to keep my feet soft and nourished and stops them from cracking which is often what happens when your work involves standing all day. 7. Oils Of Life Sleeping Cream - This is actually a night cream however as I have such particular skin on my face I found that it really didn't suit my face at all however the product is also for the neck and collar bones and so I apply it there. Its designed to help with wrinkles and ageing in the skin obviously not something I suffer with at the moment however it also contains essential oils such as lavender, lavandin and camomile that really help to relax and calm you. I like to put this on just before I go to sleep and let the essential oils relax me into a nice deep sleep. And there you have it! My night time beauty products, I'd love to hear your suggestions in the comments below if you have any great products or tips to share.